When you mess with the bull, you get the horns. Also, if you mess around during a football game, you’re likely to get flattened by a player on the field. A few days ago, Marcell Young was just minding his business and getting ready for the next play when the game got interrupted by a streaking fan. Instead of waiting for security to catch up to him, the B.C. Lions defensive back leveled the intruder and put him on his back. 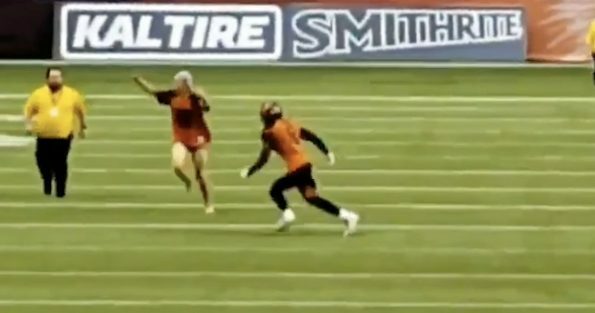 The man, who police say is in his 20’s, was wearing only blue underpants and a Lions jersey when he ran around the field waving his arms and twirling before being knocked to the ground by Young. He wasn’t charged for his crime, but was issued a $115 fine for trespassing and banned from B.C. Place for one year.